Experience the world’s finest journalism like never before with The New York Times app for Windows Phone. Stay informed on world and national news, business, the arts, technology, style, sports, food, travel, opinions, science, medicine and more. Whatever your interests, you’ll find them covered with unsurpassed quality, depth and timely insights. 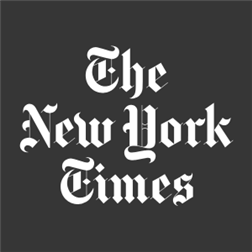 Enjoy three articles per day in this NYTimes app, from any section, or subscribe for unlimited access to award-winning journalism, blogs, videos, multimedia and so much more. • Pin sections and blogs to live tiles, store saved content to the cloud for viewing from other devices and navigate to videos and blogs within each section. • Sync the latest news directly to your device for online or offline reading. • Share articles through Facebook, Twitter and e-mail.